A search-and-rescue team member scans the ruins of an area in Palu, on the Indonesian island of Sulawesi on Thursday. Of the more than 1,500 people who died in the disaster, authorities say more than 1,200 lived in Palu. 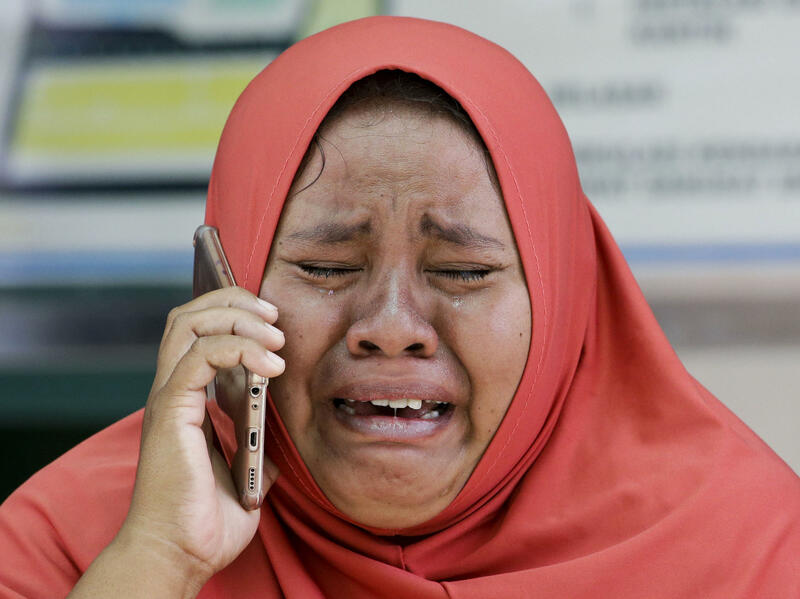 A woman weeps while using the phone of her daughter, who was killed in the 7.5 magnitude earthquake that struck Palu, Indonesia, last week. The mother did not get the chance to see the body of her daughter before she was buried in a mass grave. The tsunami that swept Sulawesi hammered Palu the hardest of the cities in its path. Of the more than 1,500 people who were killed in the catastrophe, the vast majority hailed from the city of nearly 300,000. And days later, fuel, sanitation and reliable information are still in short supply. "Rumors are flying around the camps that another earthquake is imminent, one that will 'sink' Sulawesi," Aryawan added. "The situation is incredibly tense, and people are becoming increasingly panicked as misinformation compounds an already desperate situation." Describing the scene in Palu late Thursday, emergency coordinator Wahyu Widayanto of CARE said, "There are currently only two banks that have re-opened and just some small food stores, which aren't sufficient for the community here. Gasoline is limited and drinking water is a problem and a real basic need." Also compounding Indonesia's woes was the eruption of a volcano on the Sulawesi's northern peninsula. Mount Soputan sent a plume of ash towering nearly 20,000 feet into the sky Wednesday, hundreds of miles from where the quake and tsunami struck. Since then, it has continued to spew lava. Meanwhile in Palu, some 600 miles south of the volcano, it is not lava but water that concerns Oxfam the most. Hobbled by broken roads and damaged airports, the international aid organization says it is sprinting to scale up its efforts to get clean water to half a million people in need. 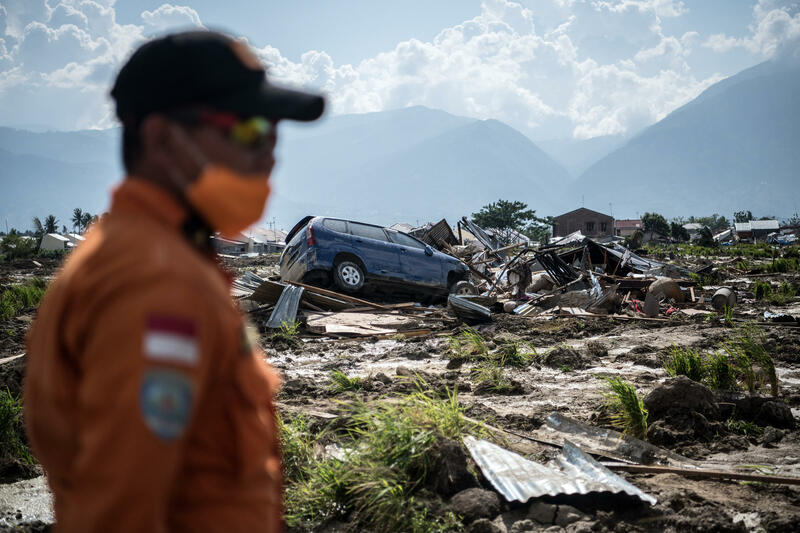 "The scale of the damage from the earthquake and tsunami is huge and there are fears many bodies are buried under collapsed houses and buildings," Oxfam's humanitarian manager in Indonesia, Ancilla Bere, said in a statement Thursday. "In many areas of Palu and surrounding towns, there is no running water and few working toilets — and sanitation is a serious concern." NPR's Julie McCarthy described the brutal scene she confronted upon arriving in Palu. "Lining the roads are small children. And they're chasing you, and they're asking for food. And they're holding up signs that say, 'We also need food. We, too, need food,' " McCarthy said. "As you move into Palu, you see along the bay just nothing but houses that have been snapped like twigs," she added. "You see cement homes that are leaning into the bay. And every part of human existence is strewn among the debris." But it is not just Palu that is suffering in the aftermath. McCarthy notes that other areas hit hard by the disaster, such as Donggala, have so far gotten less attention from aid groups than their larger counterpart — though that's not for lack of trying. Donggala remained inaccessible by road Thursday; a representative of UNICEF said the people who lived there have "received deliveries of water, rice, nappies, milk, clothes and other supplies, courtesy of the Indonesian Navy." Landslides, severely damaged roads and other challenges have made it hard to assess the full extent of the disaster. "Red Cross responders are pushing their way through debris and damaged roads to reach new areas and try to help the survivors, and they are finding devastation and tragedy everywhere," Iris van Deinse of the International Federation of Red Cross and Red Crescent Societies said in a statement Wednesday. Van Deinse said she had been with an IFRC team that sought to bring supplies to the small village of Petobo, near Palu — only to discover that, for all intents and purposes, the village no longer even existed. "When we arrived in Petobo, we found that it had been wiped off the map by the power of the tsunami," she explained. There are some signs of hope. Heavy machinery and military transport aircraft have arrived for rescue efforts in Palu, and The Associated Press reports that workers have begun to rebuild the city's power grid. Still, with more than 2,500 people injured and tens of thousands of buildings destroyed, authorities expect the death toll to climb further. And time is dwindling quickly for rescuers to find survivors. "Any delay in a disaster costs lives," said Tim Costello of World Vision, "and there have been delays."